Are we misdiagnosing the causes of employee burnout and prescribing the wrong remedies? The boom in workplace wellness programs over the last decade has focused attention on an individual’s emotional and physical health and social and financial well-being. Nine in 10 organizations worldwide now offer at least one wellness benefit to employees. And at face value, the time and effort are well spent. The average spend by U.S. businesses on wellness programs is estimated at $742 per employee per year, with a return on investment of up to $4 for every $1 spent. That’s less time off and lower employee turnover. Despite this investment and emphasis on individual well-being, the burnout problem endures. Seventy-seven percent of U.S. professionals surveyed by consultancy firm Deloitte said they had experienced burnout at work. More than half said they had burned out more than once. Are we just asking people to do too much? Worse still, are we asking people to do too much of the wrong thing? Author and Bain & Company partner Eric Garton has suggested that employee burnout is a “problem with the company not the person.” He’s right. Leaders must look again at what work is being done—and how it’s getting done. First we need to tackle one of the great heroic myths of modern work: multitasking. The reality is that the more we try to do at once, the more we’re likely to slow down work and build up the stress that can lead to burnout. A study by Microsoft and the University of Illinois found that it takes 10–15 minutes to regain focus when we switch between tasks. 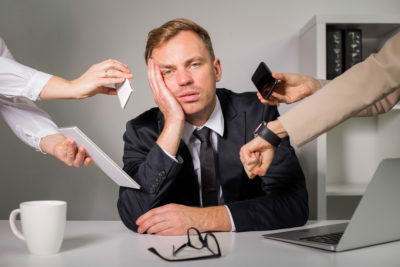 Another study cited by the American Psychological Association found that up to 40% of an individual’s productive time can be lost if he or she is asked to repeatedly switch between different activities during the day. It is far better, then, for both the individual and the business if leaders ask their teams to approach tasks with real focus. By asking these questions, leaders are not inviting answers with multiple possibilities or encouraging multitasking. Instead, leaders are encouraging teams to think about the best next action: an action that matters most and matters most right now. Teams can also flip the convention of daily to-do lists on their head to define what work they won’t do. At Facebook, for instance, managers are starting to set “nongoals”—calling out what their teams will not do while they focus on achieving strategic objectives. The challenge for leaders is to create a culture of trust within teams where people feel empowered to do their most important tasks—and nothing more. But it’s not just a problem of doing too much. Stress grows when we feel we’re doing too much of the wrong thing. Workfront’s annual State of Work research has shown for the last 5 years that employees are diverted from their primary tasks by time-sucking meetings and pointless e-mail threads. The result is that U.S. knowledge workers are only spending 40% of their time on the jobs they were hired to do. Fifty-eight percent of knowledge workers say they are “too swamped with getting day-to-day work done to think beyond their daily to-do list.” Six out of 10 see their colleagues’ work as a mystery. Our research paints a picture of employees working in a fog that obscures their most important tasks and where they fit in the wider business operation. “Cynicism and detachment” and “feelings of ineffectiveness and lack of accomplishment” are as much symptoms of burnout as physical and emotional exhaustion, according to author and psychologist Sherrie Bourg Carter, PsyD. Leaders need to set clear project milestones and encourage teams to barely accomplish them as they push toward their ultimate goals. When a team is 99% of the way toward completing a project, it needs to invest only 1% more to get it finished—not another 10%. So, while wellness programs do great work in supporting individual employees, leaders can tackle burnout by rethinking what work is happening—and how—across their whole organization. The challenge is not to find new ways to do as much as possible; beating burnout means getting work done right. Alex Shootman is the President and CEO of Workfront. He is also the author of Done Right: How Tomorrow’s Top Leaders Get Stuff Done.